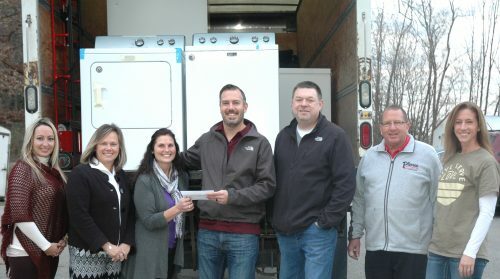 On Tuesday, Nov. 28, North Webster Church of God gave Rose Home four major appliances, several pieces of living room furniture and a check generous enough to make Rose Home board members cry. Donations included a washer, dryer, upright freezer, chest freezer, two recliners, two couches and a love seat. “We thank the community for coming together to support the Rose Home so we can continue serving women,” said Morgan. “We were servicing 13 residents with one washer and dryer. We are grateful we can now get the laundry done in a timely manner. “The money will help with operational costs to buy food and program materials like workbooks and help finance the indoor and outdoor children’s recreational center. A portion will go toward a capital campaign to build a recovery transitional home for women and their children,” she said. The material and financial donations were compiled by North Webster COG congregation members during a three-week campaign called Be Rich, which the church launched Nov. 5. The deliberate process to determine recipients of the church’s benevolence began three months ago. “In August, our Be Rich team began interviewing nonprofits in our community that were making a difference,” said Tim Jones, the church’s executive pastor. Jones described the three phases of the Be Rich effort, comporting with the verse’s precepts of giving, serving and loving. “The first week of the campaign we challenged our people to be financially generous,” he said. Parishioners were challenged to give at least $39.95. “We told them 100 percent of the funds raised would be distributed to Rose Home, Fellowship Missions in Warsaw and the Boomerang Backpack program in the Wawasee school district,” said Jones. During the campaign’s second week, “we challenged our people to serve as Jesus did, which was sacrificially,” he said. Church members volunteered 160 hours to the three organizations. The campaign wrapped up with a food drive for the pantries in North Webster and Syracuse and the Milford Food Pantry. All told, the congregation donated 5,300 pounds of food and more than $30,000. “I have been absolutely thrilled and blown away at the response of our congregation and pleased of how these funds and volunteers can further support the work of these nonprofits,” said Jones. Be Rich is the brainchild of North Point Community Church, the nation’s third largest church. North Point maintains several campuses in suburban Atlanta. North Webster COG was one of 64 churches in the United States participating in the ministry, which has donated nearly $6 million so far in 2017. For more information, call Jones at (574) 834-4281 or visit www.berich.org.